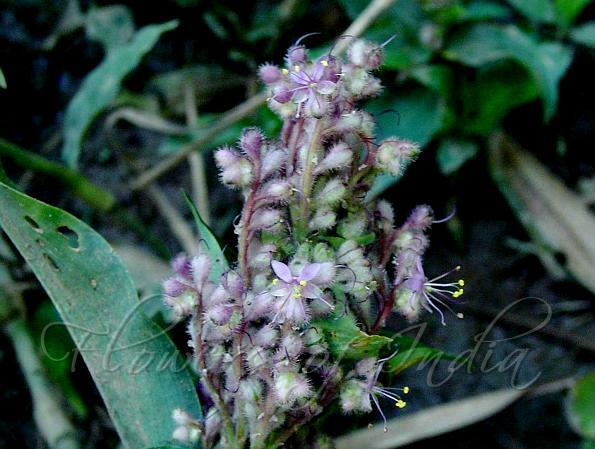 Creeping Flower Cup is a small trailing herb. The stems are stout, erect, and creeping below, 20-70 cm long. Plants are glandular velvety throughout with multicellular hairs, or hairy only on leaf sheaths and inflorescences, sometimes sheaths hairy only on 1 side. The leaves are elliptic to lance-shaped, 3-9.5 cm long, 1-2 cm wide, stalkless or short- stalked. Flowers arise in broomlike hairy panicles to 8 × 4 cm, in leaf axils or at the end of branches. Panicles are shortly stalked, pyramidal, with long, erect or ascending, many-flowered branches. The flowers are small, nearly round. The sepals are hairy and the petals are white, lilac or rosy. The capsules are 2-3 mm long, circular or ellipsoid, and compressed. The seeds are glaucous. 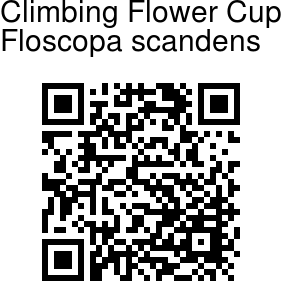 Climbing Flower Cup is found in the Himalayas at altitudes of 800-1500 m. It is also found in other parts of India. Flowering: July-November.